Paul Hinkes, Jenna Zafiropoulos, Sarah Wadsley, and Kristin Fulton in The Briefly Dead. Photo by Mia Isabella Photography / Brandon Saloy. BOTTOM LINE: We get Euripides' ancient tragedy Alcestis with a modern twist in this tale of a dearly departed's not-so-easy return. In Stephen Kaliski’s underworld, the Goddess of Death (Mia Isabella Aguirre) wears high heels and an impressive headdress made of feathers and butterflies, and has the gait of someone who’s extremely comfortable in her own body. She recaps the shadow puppetry prelude of the play (pomegranate references included) with an air of condescension; more than anything, she’s unhappy with the disruption of her perfect world, thanks to Heracles, who has absconded with Alcestis (Jenna Zafiropoulos), leaving behind the poor woman’s soul as well as a piece of his own past. So Death is pretty pissed, and the sass sets a palatable tone for this contemporary interpretation of an ancient tale. The tale of Admetus and Alcestis mirrors much of Orpheus and Eurydice, in which the protagonists’ journeys to and from the underworld bracket the narrative. Here, what starts it all is when Alcestis volunteers to dies in place of Admetus (Ben Kaufman), who bargains with Death for an extension of his life. Ultimately Heracles (Paul Hinkes), trusted BFF of the couple, retrieves her, and he is far more successful than Orpheus, in that he brings back the precious cargo without anybody turning into a pillar of salt. But the return of Alcestis is not without obstacles—she can't remember anything. So Admetus, dutiful and loving husband that he is, pulls out all the stops and summons her closest friends to help her remember, including her older sister Zena (Katie Proloux), her so-called best friend Kyra (Sarah Wadsley), and her next-door neighbor Phyllis (Sodiya Cheyenne). The trio forms a Greek chorus girl squad around their amnesiac queen bee. Meanwhile Avra (Kristin Fulton, who has a calming presence and a subtle delivery), Admetus’ trusty girl Friday, is the only one who maintains that maybe it’s better that Alcestis doesn't remember her past. The Briefly Dead tries to transplant a fable to a modern setting, in which the king and queen are confined within their penthouse-like royal court while an upheaval rips the outside world apart. The title suggests that Alcestis, with her rather temporary stay in Death's realm, is the protagonist, but the character is written as a mere passive reflection of her associates. 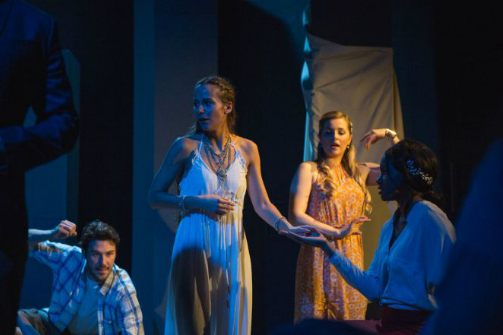 Director Elizabeth Ostler does a good job staging the various memories of Alcestis coming back to her, having the chorus forming tableaus and conjuring scenes from either a simple tune or a timely lighting effect (both lighting and sound are Jessica Greenberg's excellent designs). The production also features a team of talented and, importantly, diverse actors, though at times they don’t seem to all be in the same play. The existing narrative helps provide a rough idea of the story, but is not enough to ground the play, which is constructed out of numerous scattered scenes that lack a clear connective thread. The plot becomes increasingly murky as the motivation of each character is never made clear, with the exception of Aguirre’s Death. And the “social unrest” context also seems disconnected from the main plot, which has little to do with Admetus’ credentials as a politician. The timeless nature of Greek tragedies can make them relevant to any sociopolitical context, if seen though the right lens. Yet in this case, The Briefly Dead seems to force, somewhat unnecessarily, a Euripides piece into modern attire. With its noticeable merits and tentative intentions of making Alcestis into an acerbic satire of a present day certain something, The Briefly Dead seems to falter from having one too many ideas. Yet I do hope there’s more life to the play. After all, unlike poor Admetus, it still has the potential to thrive. The Briefly Dead is by Stephan Kaliski. Directed by Elizabeth Ostler. Set Design is by Kyu Shin. Lighting and Sound Design is Jessica Greenberg. Composer is Steve Smith. Choreography is by Katie Proulx. Puppet Design is by Elizabeth Ostler. Production Stage Manager is Gabbie Ambrus. The cast is Mia Isabelle Aguirre, Safiya Cheyenne, Kristin Fulton, Paul Hinkes, Ben Kaufman, Katie Prouls, Sarah Wadsley, and Jenna Zafiropoulos.